A few people have came up to me or messaged me telling me they have seen me on TV. 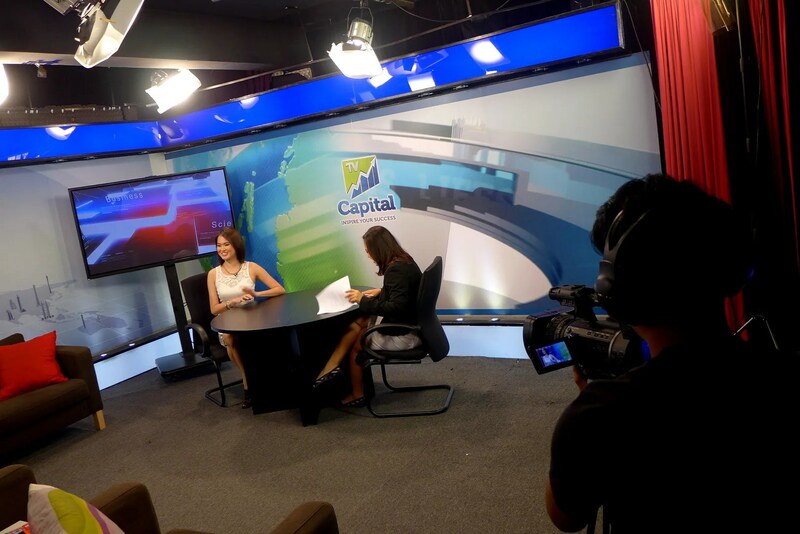 Coincidentally, I have appeared on several channels including one that is aired across a few Asian countries. So I thought I’d share the experiences here. All exciting stuff! 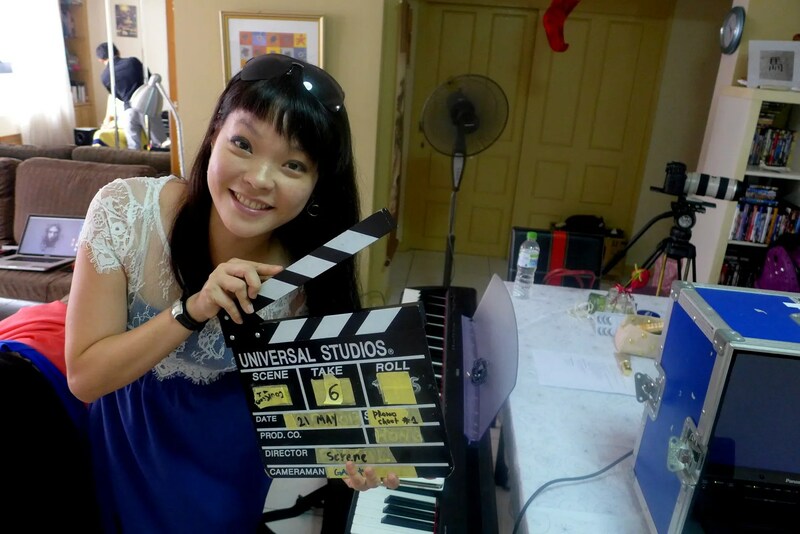 I was approached by the producer, Serene, from Singapore, a couple of months ago checking whether I would be interested to film a short promo for the popular Oz Reality Cooking Show “My Kitchen Rules”. The idea was to get our local cooking talents more exposure, while promoting for the show. I’m never one to say no to such opportunity so I said yes in a heart beat! She needed me to find someone like a family member or good friend (if you watch the show, you’ll know they also go with cooking duos) to pair with me, and of course I asked my mum, who’s the reason I know my way around the kitchen. She is unfortunately too camera shy, and so Poesy was the best candidate as she’s definitely used to the media. The video sees us talking a little bit about our passion for food, and then I demonstrated a very simple dish. For just a one minute video, the filming sure was elaborate. The crew, consisting of about 10 people, along with their heavy equipments started setting up at my place at around 2pm, and we didn’t finish until past 6:30pm. Getting my makeup done. Love the lighting here. The craziness! I’m sure our electricity bill shot up tremendously just in one day. Oh, by the way I know that my look for the shoot seems a little out of character, but they wanted a more ‘casual’ and ‘homely’ look so I couldn’t exactly dress like a rock chick! I also felt my hair was super tame. I suppose it’s not a bad thing to have multiple faces. Forgot to get a proper picture of the dish we prepared, but you can see it in the video anyway. Oh and here’s one of Poesy mucking around with the board. Thank you for helping out with the shoot! 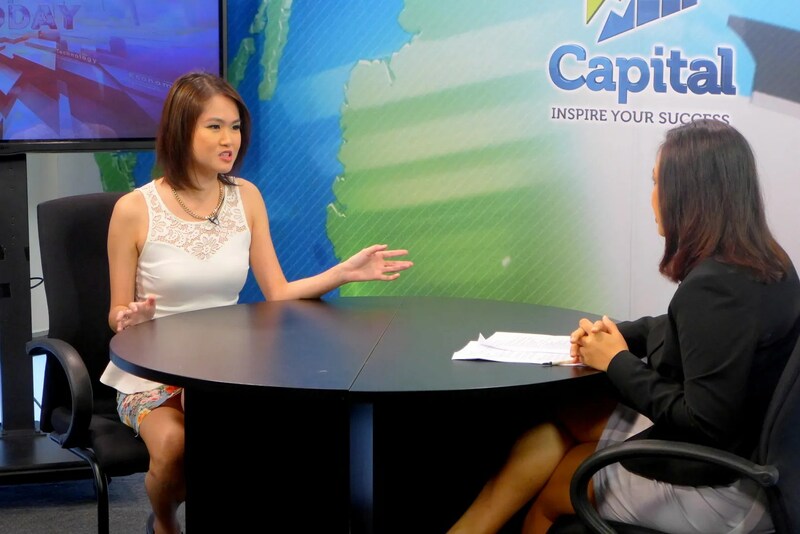 I was also invited for an in-depth interview for Capital TV, thanks to the lovely Miss Joanna Kwan. After discussing my life story and my various passions, we decided to cover everything: why I switched career to pursue my passion, my achievements, my advice to people who would like to follow their dreams, and the most fun bit would have to be about cooking, and how to stay healthy during the fasting month. Talking away happily with the lovely host, Ashikin. 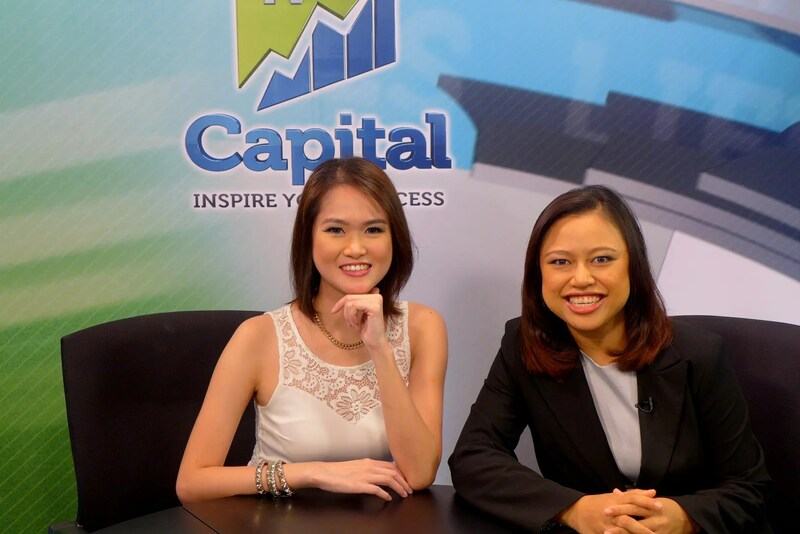 The program I was on is called Capital Today and it was aired on the 3rd July (live, with repeat). 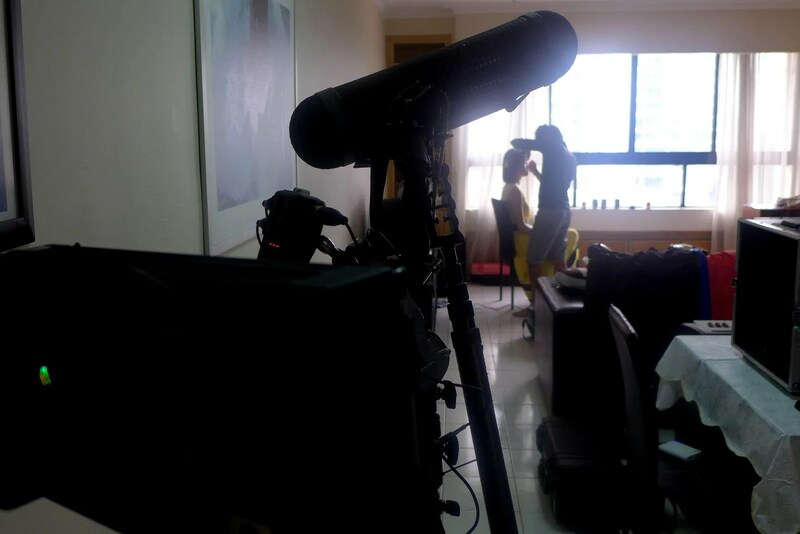 As with the Bella NTV7 interview last time, this was an early morning shoot too. I got to the studio at 8am and we started the interview just after 9:30am. Time flew by and our 25 minutes interview went past so quickly. Compared to my first interview, I was a lot less nervous this time. I only got tongue tied twice, which was an achievement. All smiles after completing the interview. Thank you Sharlene (producer) and Joanne for the great opportunity! I wasn’t going to announce this one publicly but since I have appeared on it a couple of times according to my friends (I even had strangers coming up to ask me about it, which was a strange experience). But last month I have actually auditioned for The Voice of China. And they have been showing the auditions on air, so I got some airtime as well. I was alerted by Louise about the audition just a few days before, but thought I would just give it a go anyway. It sure has been a very long time since I’ve performed Chinese songs though (must rectify that one day), so I spent hours trying to figure out what to audition with. They were only going to choose one contestant to represent Malaysia, so it’s pretty tough! The audition was held across the weekend (Sat and Sun). I ended up being supremely hungover on Saturday morning so I went on Sunday instead. Woke up nice and early, and ended up being the 31st contestant (early bird gets the worm, so they say). So I went in and did my thing, and lo and behold, I got through to the second round (Top 80 out of 550, not bad huh?). Didn’t get any photos for the whole process, unfortunately, so you’ll have to read, hah! The second round audition was held all the way in Shah Alam where NTV7 studios used to be, so that was my second time at the location. We had to be there at 8am, and let me tell you it was a long day! I had barely any sleep the night before but luckily my adrenaline kept me nice and high. Let’s just say the competition was pretty fierce and we all had to wait for everyone to finish with the first round. Since I was in the first batch, we had 4 hours to kill after our round before the results were announced. Being the crazy chick, I was naturally joined by equally noisy bunch of singers and we actually had tons of fun. Well, I can tell you know that I didn’t get the spot to go to China. I kinda expected it because I know the judges will prioritise the local artists (the ones who are already quite well-known in the Chinese Entertainment Industry). And also I probably should have gone with an English song instead, which is more of my forte. But nevermind! It was a great experience and it at least got me some decent exposure! Oh by the way, if you haven’t been following my social media, I just totally changed my look again. 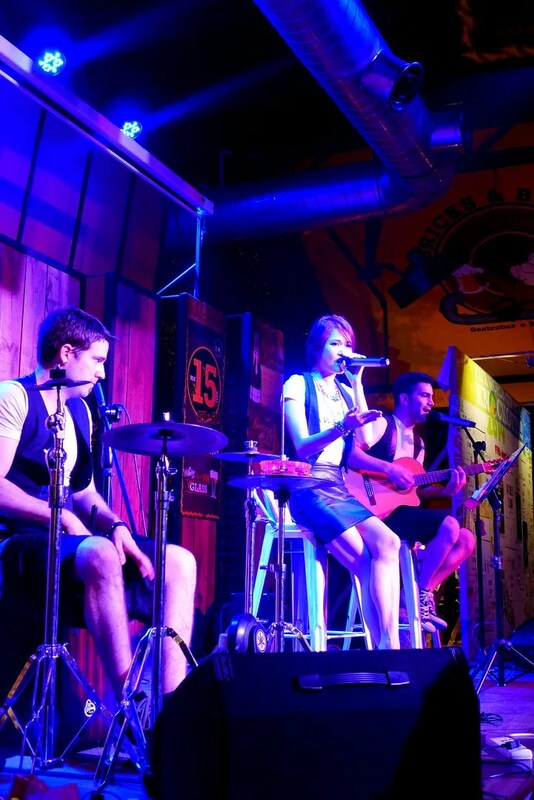 Here are some photos from our recent gigs. Do you love the RED? Because I sure do! 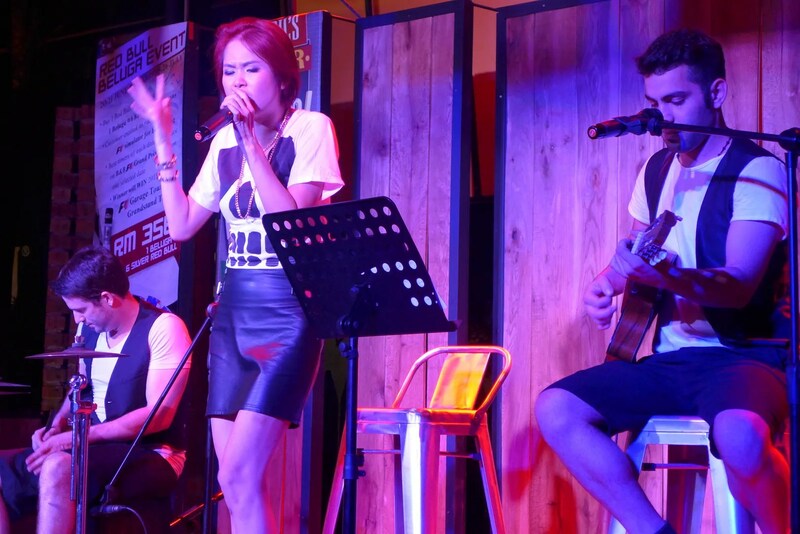 Here’s another one at Bricks & Barrels, Hartamas with my Mad Sally boys. I’m a huge fan of My Kitchen Rules, I watched the original production on Channel 7 Australia though so I don’t know about the Astro one. I wonder if the Twitter comments that pops up on My Kitchen Rules Season 5 on Network Seven (Channel 7 FTA and Yahoo!7 TV) will show up on the Diva International Asia rebroadcast on Astro? The original program on 7 features tweets of people who tweeted with the hashtag “mkr” and superimposes a couple of the more interesting ones on the show, which was fun since I was in Sydney at the time (a much smaller claim to “fame” haha but gotta love the interactivity). Season 5 is great though, good job on appearing on the local promo (and the other media appearances). Cheers Kelly! I’ve only managed to catch season 1 before I moved to KL. I’m not sure if the twitter comments will show up, after all this would be a delayed broadcast (I don’t have Astro at home). Maybe you can check it out? No worries, I doubt it’ll have the original social media stuff too, since Diva would want the show only. I would if I were a network, since the social media stuff doesn’t apply to my market (Asia). Thank you! I am probably not wise, but at least I am happy. Hi Kelly, just saw your video recently on Diva, I was like hey, isn’t that Kelly? 😀 love it!